Max Factor with his Beauty Calibration Machine. Cruising in our blue Mustang convertible on my recent trip to California I truly enjoyed all the glamour there was to muster up! People would stare and say, "Wow, who are they?" I am a sap for all the stargazing I did! Even the foot and handprints at Grauman's Chinese Theatre made me feel close to all the stars I love! A trip to Santa Monica led us to Marion Davies' guesthouse with pool. I could only imagine looking at the long row of windows the luxurious glamour that was pioneered there! And oh the fun in the pool! The actors of days gone by stand out strongly in my mind! The days of writers! Upon entering the Hollywood Museum and greeted by a Patrick Swayze look-alike I was struck by this Art Deco palace as it used to be The Max Factor Building. The first floor housed all the makeup memorabilia from the "For Blondes Only Room" -- Marilyn Monroe, Lucille Ball to Joan Crawford! Their hair dryers, their glassed-in mirrored vanities and the lot! Even a telegram to Mae West inviting her to the latest Max Factor line introduction from Max himself! Technicolor blood, grease paint and theatrical powder were some evidence of an era gone by. Does anyone remember the actresses' black and white photographs so perfect looking? The makeup was perfection. Many owe it to Max Factor. 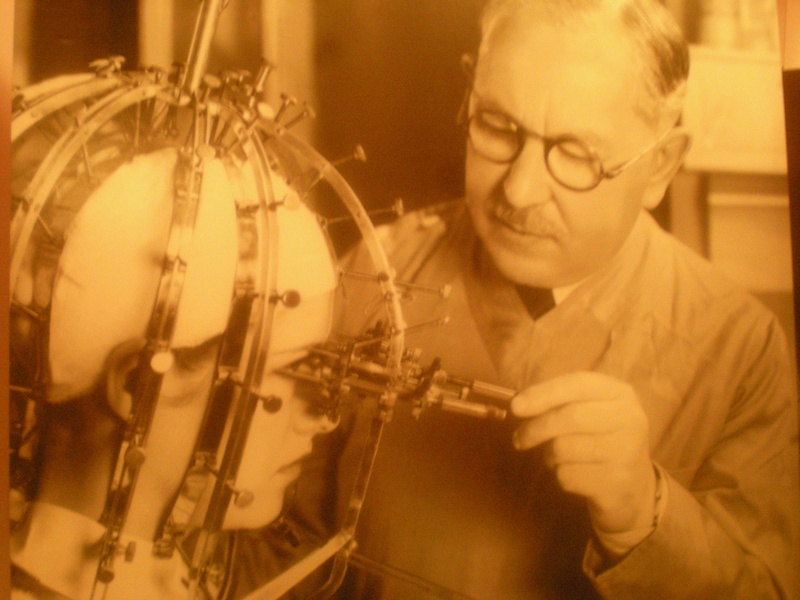 In 1932 the legendary Max Factor devised an ingenious invention combining phrenology, cosmetics and a scientific analysis to a women's facial imperfections. The Beauty Calibrator was invented -- also known in the trade as The Beauty Micrometer --, proving that a natural "Perfect Face" was a myth. This is the only Beauty Calibrator in existence. The human face has flaws can be recognized by this invention and then can be corrected with pancake shading makeup applied precisely to achieve the "perfect face." Imagine that! My quest toward facial perfection is answered. After all my, Mom would say, "If the movies in Hollywood won't hire me maybe the comic strips will! "